By Saturday morning, $176 rolls in. What the…? It’s 2:10 PM on Saturday. Abby is napping. I kiss my wife goodbye, gather my keys, and dash out the door. I head to Target to look for Dave. I’ve already tried once, but couldn’t find him. As I get close to his usual spot, my heart sinks: he’s not there. 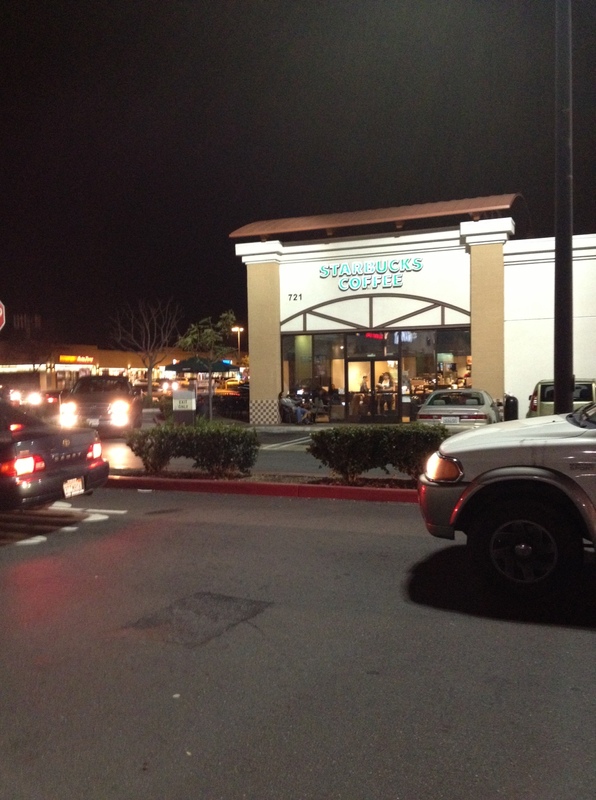 On a whim, I turn right, and drive to the adjacent Starbucks. Bingo. I see him sitting, reading the paper. I park, hanging over the white line on the left, and run to where he’s seated. “Hey Dave! Can I join you?” I’m a little out of breath. He moves his papers aside, and I see he’s reading a book. It’s something about William T. Sherman (“I’m related to him,” he says). I explain a bit about this blog, and how you’ve been reading it. Part of me is a little scared to tell him I’ve been writing about our time together. I tell him you have loved him through your comments, suggestions, and now your dollars and cents. He looks dumbfounded. Frankly, I am too. Dave explains that he didn’t get to see his kids earlier in the week, but that he might tomorrow. He says he’s dejected, as he hasn’t been able to generate much cash from collecting cans. He feels that he’ll be dirty, tired, and inadequate in front of his children. It’s 2:25 now, and we’re inside Target. People are pushing carts, children are running the aisles, and Dave is dashing about, looking for jeans, shirt, belt, and a few other things. Dave sees something he likes … so many options! “Do you like this one? Do you think this looks good?” he asks, showing me a dark shirt with rolled up sleeves. Dave has good taste. I didn’t realize Target had such sweet shirts. We find the dressing room. He seems overwhelmed, giddy, and excited. He scurries off to try on the clothes. My heart is pounding too, and I’m not sure why. We make our way to the checkout. I watch his face as the total tallies to $100.06. He blanks. “It’s OK Dave, we can return something if you don’t like it,” I offer. The cashier looks at me, obviously aware that two worlds are colliding. She smiles. “Oh my gosh, $100 dollars, that’s way too much. I didn’t know it was going to be that much,” he says. I assure him it’s ok. We sit outside, and I ask him what he’s feeling. He’s great at articulating his emotion. He’s overwhelmed, and feels he’s spent too much of your money. He can’t believe he just spent $100. Changing the subject, I ask him again if he’d like to spend tonight in a hotel. Since he has an opportunity to see his kids tomorrow, it seems like getting cleaned up tonight would be freakin’ awesome. Dave is still thinking about the money. I suggest we return some items, which might make him feel better. We decide to return some boxers, the belt, and a white undershirt, leaving him with the jeans and the shirt I’m starting to covet. This leaves him $48 in cash and some change, which I hand to him. My wife texts me, asking me to be home by 2:50. As we walk hurriedly out of Target, Dave asks me if I’m going to be late. He’s very conscientious. “No worries man, I’ll just tell her I hit all the red lights,” I say, smiling and half-joking (but sort of half-serious). He stops, and shakes his head. “Don’t lie man. Don’t ever, ever lie to your wife. I did that a few times and it ate me up.” Wow, convicted. At 2:45, we’re making our way to my car. We make plans to meet at Starbucks at 6:30, and then we’ll get the hotel. I can see that I’m confusing him with my rapid-fire questions and summation of our plans (if you’ve worked with me, you know this about me — I gotta work on it.) I slow down, take a breath, and give him a hug. As I pull out of the parking lot, I honk. He gives me a huge smile. “See you later, Dave!” he yells. I see him talking to someone sitting outside Starbucks. He looks alive. It’s 5:44, and Abby is peacefully asleep in the back of our car. Her little face, eyes closed, slumbering breaths. Kills me with her simple innocence. My wife and I have just finished dinner to celebrate Sarah’s grandma’s birthday. While we were eating, online donations went up to $376. I can’t believe it. It’s just starting to get dark. This is the time of day I struggle with seeing. I have keratoconus, a disease that affects my cornea. It means that I’m almost legally blind in one eye. Scared to drive with me now? As we turn the corner onto our street, I notice a collection of bags, boxes, and other items on a lawn, remnants of a garage sale. Looks interesting: might be some stuff Dave and his friends could use. I see a man sitting on his porch, laptop perched on his knees. “Hey, are you getting rid of this stuff?” I ask, smiling as I approach. His name is Ed. Retired Costa Mesa Police Officer, now teaching at Calvary Chapel Costa Mesa. He’s a Spanish teacher, just like my wife. Ed’s the kind of guy everyone wants as a teacher in high school. He’s cool, and because he was a cop, he’s got cred. As we talk, a group of high-school aged boys drive by, honk, and wave. Ed runs up to them, gives them a hearty smile. “Go on you knuckle-heads, be safe,” he bellows. They laugh and drive off. We have a lively conversation. He’s not getting rid of the stuff, rather, transferring it to a storage unit. 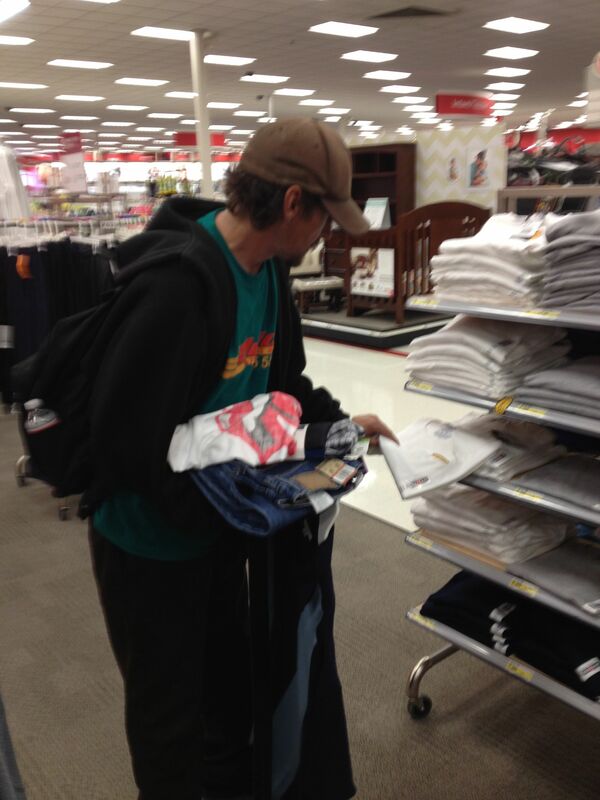 He has lots of clothes, about the right size for Dave. I tell him why we want the clothing, and offer to pay for all of them. He declines, and gives us the money back. “Use that to buy the guys some lunch,” he says, smiling. We pack all the clothes in a big blue bag. A new friend and a new ally in learning how to bridge the gap between the homeless, our city officials, and our community; I make a mental note to talk to him again. It’s 6:32. I’m late. I hate being late. You might know this about me. It makes my skin crawl and I think of all the worst possible scenarios. I hate putting people out; I don’t want to disappoint them. I don’t want to disappoint Dave. I park, and get out. I look around, but I don’t see Dave. I wander around the building, wondering if I’ve missed him. I see people watching me; I wonder if they think I’m up to something. I glance at my cell phone as the minutes pass. I’m pacing the parking lot. Am I getting stood up? Did something happen? Lots of insecurities start popping up. I’m here to help. Why do I feel attacked? At 6:49, I text my wife. Not here. Wonder if I came to wrong Starbucks. I hope everything is ok. What u gonna do? Not sure. I’m pretty sure he meant this one but could mean the one at Target. My wife offers to get Abby, drive to Target, and check. I agree. At 6:59, the phone rings. I answer, and it’s noisy with background noise. “Dave, are you ok?” Sounds like a pay-phone. I’m a bonehead. Went to the wrong Starbucks. I jump back into the car, and head back in his direction. Should take about 10 minutes to get there. I find Dave sitting on the railing outside McDonalds. I run up, apologizing. I feel badly that I’ve robbed him of a few minutes of peace in his hotel. “Oh, I was so worried, I thought something happened to you, Dave,” he says. We vacillate between eating now or getting a hotel first. We change our mind 4 times, and then decide to head to the hotel. He’s excited, nervous. We’re walking towards the car, and a shorter man approaches us from the shadows draping the parking lot. He has a big smile, a few teeth missing, and is wearing a black shirt and old tattered shorts. He is obviously homeless. “Oh, man, I don’t have any cash on me. I’m really sorry,” I say, as I pat my pockets. I already know I don’t have cash, but for some reason I always pat my pockets as if I might. The man turns to look at Dave. “Do I look like I carry bills?” asks Dave, as he riffles through his pockets. We all laugh. I probably stick out as the one who should have bills. I wonder if he thinks I’m lying. “You wouldn’t happen to have any smokes on you, would you?” he asks, looking at me. I shake my head. And then the most amazing thing happens. Dave hands him a $20, part of the change I gave him earlier. Without hesitation, he blesses this stranger. I’m dumbfounded, and can only fumble out a “Hope you have a good night man, see you ’round” as we make our way to the car. I don’t even get the guy’s name. I can’t think straight. It’s 7:35, and we’re inside room 224. He’s so amped: he can barely stand still. I wish you could see him. I wish you could be here with me. I open the blue bag Ed gave us. His mouth drops when he sees all the clothing. We take out the clothing, look at each, and put a few to our noses. They smell clean. “Do you want me to get you a pizza?” I ask. “Sure, yah, let’s do that. Wait, no, I can eat later. I want to clean up first,” he says. I can tell he is a little overwhelmed. I would be too if I hadn’t bathed in 3 months, and some guy tells me the “The Internet” has given me $376. “Here, let me show you the first names of the people who care about you,” I say, as I take out the list of those who have given. I read off the first names, and he writes them down. He says he’ll pray for them. “I pray every night now,” he says. That night, around 8:30, I call Dave in his room. He answers, and sounds like any of you: he sounds “normal”. “Just lying here in my boxers, relaxing. I feel great!” he says. He thanks me for checking in on him, and we make plans to meet the following morning for church. “I’ll call you 10 minutes before I get there,” I say. It’s Sunday morning, 8:32. I’m in the hotel parking lot, engine on, wondering if Dave is coming down or if I should go up. I knock, and Dave opens the door. I enter the room, which smells faintly of smoke. Dave looks great. He’s shaven, wearing his new clothes, and is smiling. “Man, you look amazing!” I exclaim. He accepts my compliment. We jump in the car. Dave seems peaceful. He says he stayed up late, watching TV and vegging. He took 3 showers. He says he didn’t want it to end. This breaks my heart. He says that he got some good rest, without having to look around. Things are relatively safe under the bridge, but he usually sleeps with one eye open, just in case. Then Dave checks in with me. “Hey, I want to check and make sure I didn’t hurt your feelings yesterday,” he says. He’s referring to when he gave the other homeless man $20. “Not at all man. You’ve been blessed to be a blessing to others,” I reply. Dave surprises me with his high EQ. This kind of checking in is healthy. Dave is shocked that people outside Costa Mesa have contributed to his needs. I rattle off some of the states I know you’re in. Dave shakes his head. “I don’t get it. I don’t understand,” he says. We walk into church, and make our way to the coffee and donuts. Suddenly, Jaime, who met Dave last week, approaches us, and has a bag of gifts for Dave’s two children, and some new clothes for Dave. Dave graciously accepts them. Dave sits next to me, in the front row. “The front row, again!” he says, as we sit down. That’s the way I do it, I say. As the message ends and the service moves to worship, Sarah brings Abby from the nursery. Every Sunday, I enjoy this moment immensely. Abby puts her little hands out to me, and I reach for her. She leans her little body around me, and places her head on my shoulder. Her soft brown curls tickle my face. I smile; this is Heaven. I reach for Dave, and touch him lightly on his arm. He looks over. He breaks into a smile. It’s 10:45, and we have 15 minutes to make it to the meeting place. Dave is eager, excited, and hoping that we make it on time. We need to stop by the bank in order to withdraw some of Dave’s money. We’re driving, and I ask Dave about the type of work he’s done in the past. He describes his experiences. “But I have to tell you, none of those things made we excited to get out of bed in the morning,” he says. “You know what? I’ve met people making hundreds of thousands a year, and they’re the same way – so don’t worry, it’s not just you,” I say. We find a bank in the same shopping center as the meeting place. Dave wants to take his kids out to eat, and have enough to repair his tarp (which broke from the weight of the rain water). And he wants to make sure he has enough left over for his ID. Because of your love, Dave will get to see his kids, buy them lunch, give them some gifts, and enjoy the Super Bowl. At 11:02, I say good-bye. Dave has cash in his pocket, new clothes, and a list of friends he didn’t know existed just 24 hours earlier. He tells me he’ll walk from here to the meeting place. I hope in my heart that everything works out, and that he gets to see his kids. “Love you man,” I say, hugging him. “Love you too dude, I’ll see you later.” And like that, he’s gone. Because Dave doesn’t have a phone, I don’t know what’s happened since I saw him last. I’m hoping, praying, that he had a chance to see his children. I’m hoping that your love gave him a mental and spiritual boost. Share this story. Send it to your friends, post it to Facebook. Leave Dave a comment. Tell him where you’re from, and how you heard about his story. I’m going to show him these posts soon. If you have words of encouragement, leave them here. He’ll love reading them. If you feel led to give in any amount, you can do so here via PayPal. I will steward the resources you provide, and will display a full accounting of how the money has gone to help Dave. I’m keeping track of everything you’ve committed, and taking note of exactly where it goes. I’ll post that soon. This story is far from over. Will you join me in impacting this man’s life? The entrance to the Target parking lot, where Dave sometimes hangs. This is where I met Dave, standing against this pole. The hotel you gave Dave a chance to enjoy for a night. The Starbucks where I sometimes meet Dave. Blessings overflow my trunk. 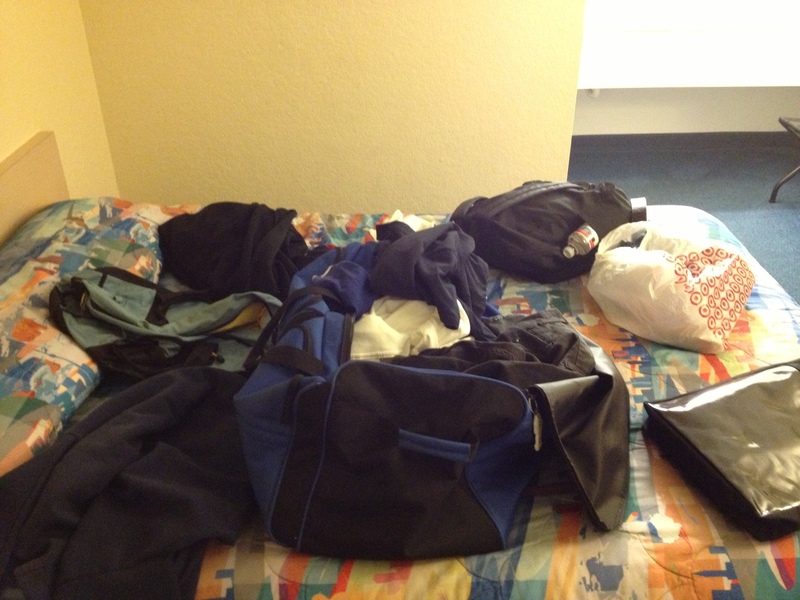 The blue bag is full of clothes from Ed. Sleeping bags and other items donated by Kristy. Hi Kristy, thank you! I’m excited to share the latest. It was really an amazing weekend and such a powerful demonstration of love in action. Would love to get together soon. I know you’ve sent me some email(s) that I haven’t had a chance to respond to — please forgive me. This keeps being amazing! And I totally agree about Abby as an old soul! Listening to you describe yourself, Dave, you strike me as very driven. I like Dave’s contrasting easy manner. It’s really hard to connect with someone who has no phone! Doesn’t that make you go a bit nuts?!? This whole homeless experience is both jarring and just the right fit for me. We are united by our mutual experiences. Like most, I am traumatized, displaced, and without a stable support system. But I am also dwelling in close quarters with strangers that I cannot afford to trust. This story is as lovely as it is revealing. You may hate to be late, but I hate to be early. I hate waiting. I like to hit the ground running. If you came at me with a bunch of questions, I might just break into a goofy monologue and go off topic. Or ask you to write them down. It’s funny how different people are. Dave & Dave: very different people with the same heart. I’ve been thinking about what might be beneficial to Dave right now and perhaps that would be a sturdy footlocker and a decent lock, so that he can keep his new things nice & safe. If he is going to continue to stay under the bridge until he can interview for the OCRM, I’d suggest building a small support community of other men that aren’t homeless, like from your church, and bring him into your homes for lunch and begin to help him maintain his “nice” like a weekly shower and some laundry. There is no practical point in acquiring new clothes if you end up ruining them. Hey Dave! Thank you for sharing this awesome story. My family was very involved with the soup kitchen our church sponsored growing up, and my stepmother continues to be involved. It is a cause that is near and dear to my heart! I have met some wonderful folks through the years that have fallen on hard times. I hope all the help/support this online community offers will help Dave get back on his feet! I am a firm believer in paying it forward and the generosity Dave demonstrated helping out his neighbor was a beautiful gesture! I am cheering for you both and will continue to look for your updates! Hey Ashly! Thanks for stopping by and providing encouragement! I, too, was surprised at his generosity. I feel that he is genuinely trying to get back on this feet, and that the support of this community will play a part in helping him get there. It’s great to hear that your family was very involved in things like this when you were younger. How did that impact you? I’m thinking about my daughter, and how her life will be changed by growing up in this environment. What do you think? Hey Dave, I just want to let you know that my family and I are praying for you and your family and we are sending you lots of positive thoughts and strength! I’m extremely inspired by your story. Thank you for that gift. Keep moving forward and God bless you! Nicole, thank you for stopping by and encouraging Dave. I will see him tomorrow and make sure that he hears from you! You rock! It’s Caleb, the shoe guy. I wanted you to know that, in my experience, God expresses his love for us through people and meeting our needs. The day we prayed together I got a strong sense that God saw you, loved you deeply, and wanted you to know that you are loved. I prayed that God would show you this love. I feel that God has been showing up through Dave and all of the people who heard your story and have wanted to help you out. God loves you and is pursuing you with reckless abandon!!! I hope to see you soon!! Wanted you to know I am praying for you. God has a plan for you… And its starting to look pretty amazing! Just remember everything happens in Gods perfect time. 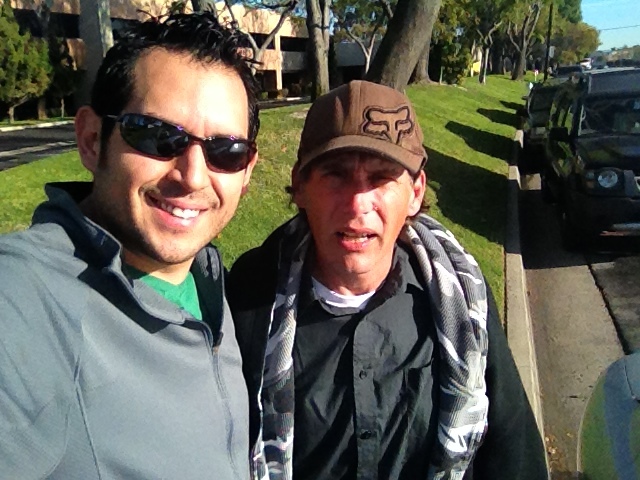 I was so honored and blessed to meet you a couple weeks ago… Dave R brought you by the outreach I do in Santa Ana to get the sleeping bags for you and your buddies. You are welcome back anytime! And if Dave R lets me know when you guys are coming Ill even bake you some more goodies (I hope you enjoyed the brownies)! 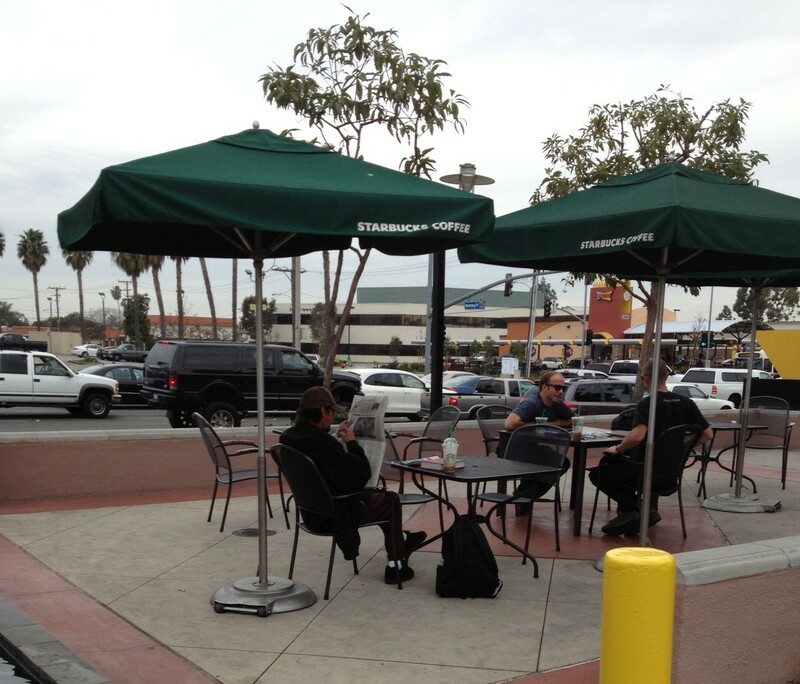 I’m often near the Costa Mesa Square… so maybe someday Ill see you there sometime! Take care of yourself! And I hope to see you again soon! Kristy, thanks for your encouragement and support of Dave. I spoke to him this evening, and his voice sounds good and he seems encouraged. He has taken steps forward and is continuing to aim for entrance to the OC Rescue Mission. I took a tour yesterday — what an incredible place! Hi OC Rescue Mission, thanks for stopping by! It is great to hear that these stories have touched people. I hope that Dave is able to become your next student, and that he will find his way forward through your organization’s help. What a great thing you’re doing!